During the month of April, our major focus of learning was through a thematic lesson where through studying about famous and influential people from all over the world were studied. Bring history to life with a Living History Museum Day! Bringing history to life serves a dual purpose. To research and prepare aLiving History Museum Day, students must synthesize the information they learned to create an exhibit representative of their subject. This can't happen unless they are actively engaged in the event. Students were given famous and influential people such as Georgia O'Keefe, Muhammed Ali, Mao Tse-Tung, Nadia Comenici, Eleanor Roosevelt, Benazir Bhutto, to name a few, and they were to select pivotal events or recreate significant circumstances in that individual's life through extensive research and studying of that person's behaviors. In our class, we used our ELA, Social Studies, and Writing classes to learn about, study, and write an expository essay about their famous people. Along with learning about the person's behavioral characteristic, they also created a poster and props that went along with their person's major contribution to society. With much preparation and practice all throughout April, students presented their Living History Museum on Friday, April 22nd. Students were in full costumes and did an amazing job portraying their famous person to any parents, relatives, friends, and other students who came to being all of their historical figures back to life, even if it were for just a few minutes! Our scientists have come a long way since the start of the school year. April and May are the compilation of the hard work and concepts that your students have learned. Fourth graders are eagerly studying the body systems which include dissections of skeletal muscles and modeling of the bones. They are currently exploring the circulatory and respiratory system which includes a look at a sheep heart! The 5th graders wrapped up their study of space with a tour through history including the space race and the events that have forever changed exploration. They eagerly jumped in the Mission to Mars rover project which started with lessons on being a good engineer and the laws of motion. They will continue by studying electricity and magnetism with hands on projects including building a simple battery and motor. The 6th graders finished up the challenging world of plants including a simple flower dissection and flower pressing. They have journeyed into the animal kingdom. It is a challenging section but they will learn about the phylums and classes that make up Animalia. The 7th graders are studying the complex but exciting and relevant world of nuclear energy. As a final wrap up project they will be doing town hall speeches for or against nuclear technology. Finally my soon to be graduating 8th graders (sad to see them leave but excited for them) are pushing strong to the end with a in depth look at the body systems completing multiple dissections including a sheep heart and if time allows a full fetal pig. With Iowa testing finished we head into the final stretch of school, the final quizzes will be May 13th. We have career day, field day, and a few other end of year fun events including the long awaited science fair pizza party reward! It has been an amazing year jam packed with learning. I could not have pushed your students forward without your support! It is so exciting to anticipate the warmth of Spring, too bad its so cold outside! But when the weather is enjoyable and nice, the children love to be outside more and more everyday. Each time we go outside, we can notably see the changes of the season such as the green grass, some leaves and birds migrating back to the Midwest. Our toddlers are always excited to see and hear the birds in the morning. Once the weather gets a little better, we are excited to finally plant some flowers and explore the creepy crawlers in the dirt! The toddlers enjoy this sensorial experience feeling the various textures of nature. Feel free to send your children with extra flowers to plant. From my past classes, children and parents loved shopping for flowers to grow in school. The spring is also a great time for us to start more challenging academic activities such as language cards and sand paper letters, sequencing cards, memory enhancing activities and Montessori derived mathematics where children recognize numbers and associate numerals to their symbols and quantities. For parents, get ready for parent teacher conferences! Feel free to arrange a time with me in the coming weeks. I am excited to updating you on the developments of your child. Also a special welcome to our newest friend, Sufiyan! Welcome back after the Spring break. We have some excellent weather in our horizon. This past month, the children have been indulging themselves in the individual food prep activities. Also, they enjoyed making mashed potatoes and sugar cookies in the classroom. We are now proficient in scooping melons, peeling hard boiled eggs, grinding the egg shells etc. Practical life area will continue to build time motor skills and preparing hands for writing. During the early March, we also concluded the study of food pyramid and human body. As an important part of the sensorial area, we also explored five senses with our children. The children experienced tasting different foods in the classroom. For example, lemon for sour, coffee for bitter, crackers for salty. Moreover we talked about spice as a taste. Spring is the beginning of new life. In continuation to the introduction of growth of plant life and look at the trees beginning to have leaves, we will be visiting Morton Arboretum to see plant life. With that we will discuss life cycle of vertebrate animals, e.g. frogs, turtles. We had a presentation on the life cycle of the chicken. The children had an opportunity to feel and touch chicks. Also our children will be doing “hands on” gardening. Our continent for this month is Africa. We will work on countries, flags, landmarks and animals of Africa. We will reintroduce the solar system with the emphasis on the Earth and integrate importance of recycling and need to save water, electricity. We are going to talk about volcanoes and inner layers of the earth. Children are just focusing on math facts, in addition to that, they are doing 4 operations (+, -,*, ÷). The younger children are working on bigger numbers and sequencing. 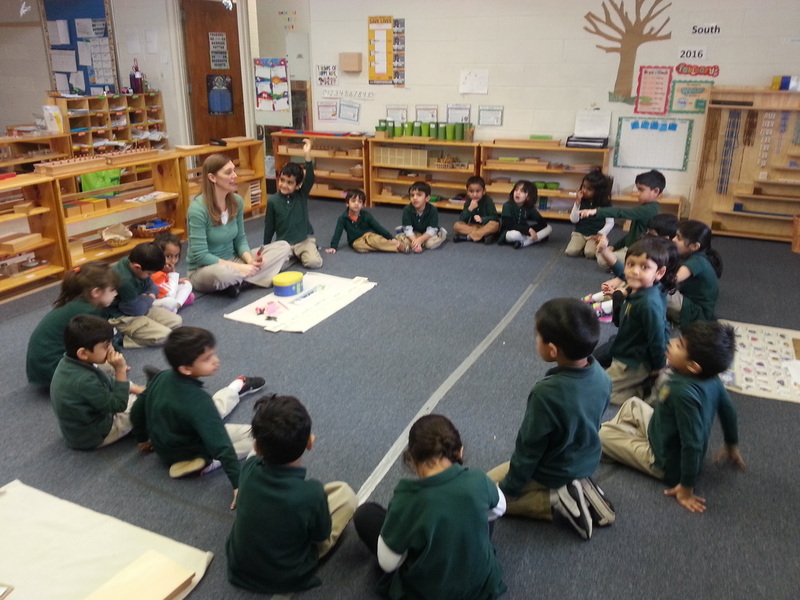 The kindergartners are building sentences, writing stories and reading fluently. The younger ones are starting to read gradually. Also many children have developed the handwriting skills. During circle time, we read books to children every day. Here is a snapshot of some books that we covered during the month of March. Have a wonderful month and enjoy this beautiful weather! ​Ms. Sujata, Ms. Hebba, Ms. Sravani, Ms.Faiza, Ms.Ridhima, Ms. Archana and Ms. Anab. ​Teachers are real life superheroes in our community. They educate, innovate, encourage and support our students and each other. Every day they touch the lives of millions of children and their work and impact extends far beyond the boundaries of the classroom. Teachers are an inspiration in our school, who through their dedication to children, work millions of small miracles every day. And the vast majority of teachers in the United States are proud to be advocates for children, public education, and their profession. Teachers, principals, coaches, librarians, and other school staff put themselves on the line everyday for our kids. And, they don’t often get recognized for this challenging work -- a little bit of thanks can go a long way! We decided to dedicate the first week of May in appreciating our teachers and kept a multi-cultural theme through out the week. Our Parent volunteer's did an Phenomenal job is bringing in food items for breakfast and lunch. Many of our students also brought in thank you cards and gifts as well. Thank you Teachers! We also Acknowledged our Office Coordinator Ms. Farheen for all the hard work that is put in running the front office. We surprised her and sacred her good and showed our true appreciation for her. We hope everyone had a relaxing spring break. We had a wonderful spirit day with henna and face painting last month. Also, our 6-9 students were invited to our 3-6 classrooms and they read their favorite story book to the 3-6 year old students. Our Parent-Teacher conferences are on April 15th. Please sign up for the conferences online when the link is provided. The First year students will continue working on the United States of America (practicing the fifty states) and landforms in history and geography. In zoology, the students will study parts of a mammal and life cycles of different animals. In math, the students will practice telling time, golden beads division and fractions. In language, the students will work on adjective study and persuasive writing. The Second year students will work on continent study of Africa. In math, the students will continue working on fractions, checkerboard: three digit multiplication. In zoology, the students will work on invertebrate animal study. In language, the students will work on persuasive writing, conjunctions and different verbs. Our third graders will take the IOWA Test on April 25, 26 and 27th. We will do two weeks of intense test practice prior to the test. Please make sure your children sleep well and eat a healthy breakfast for those three weeks. Their psychological and physical well-being is very important during that time. Please make sure your children will not miss any practice time. Also, the third year students will work on the history of the United States of America, fractions and persuasive writing. As always, your child's well-being is our priority. If there are any concerns, either contact us through school e-mail, by phone or send a note with your child. ​Ms. Mariya, Ms. Cortney, Mr. John, Ms.Indrani, Ms.Kala, Ms.Samia, and Ms. Madiha. Middle School students have been working hard this month! We had a fun field trip to Dr. Martin Luther King Jr. Park and Family Entertainment Center in Chicago. The students had the opportunity to learn about how roller skates are made and then were given the opportunity to roller skate for a few hours. It was a great time had by all!! The classroom has been just as busy this month! In Language Arts the students completed their study of the novel “Into the Wild.” This was a nonfiction book about Chris McCandless who graduates college and goes off to explore Alaska. The students were able to explore various themes presented in the novel such as the American Wilderness, risk and self-reinvention, and materialism and idealism. At the completion of the novel, the students completed timelines with detailed events from the story. In social studies, the 7th and 8th graders have been studying ancient Africa, ancient Americas. Many aspects of geography have been incorporated into these units. Students, using Prezi software, made presentations about the various geographic regions in Africa as well as including what the culture of each region is like. 6th grade social studies are working on a unit about the Holocaust. The students will be turning our classroom into a Holocaust Museum with numerous projects that they have completed. These projects included making a shrine to honor victims, writing an allegory, and sewing together a quilt to represent the events that took place during the Holocaust. All of this coincides with National Holocaust Remembrance Day that takes place on May 5th. Middle school students are working hard to finish off the school year! We had a wonderful field trip this month where we were able to give back to those in need. We went to the Northern Illinois Food Bank and spent a few hours there packing potatoes. In grand total, the students packed over 3,000lbs of potatoes and fed over 3,000 people!! It’s a humbling experience to be able to give back to the community.The classroom has been busy as we begin to prepare for finals and summer vacation! In Language Arts, the students have been studying World Literature. They have read short stories, fiction and nonfiction, written by authors from all over the world. They read from authors who are from the Americas, Europe and elsewhere. The students have also been spending some time analyzing various poems. We have read Emily Dickinson, Robert Frost and E.E. Cummings. Students will be wrapping up the school year by writing their own poetry anthologies. In social studies, the 7th and 8th graders have completed their study of the Muslim world and have been working on the Russian Empire of the Ancient World. This year they students have had the chance to learn about all the ancient civilizations. We will finish the year by learning about the Crusades and how they shaped world. In 6th grade social studies, the students completed their Holocaust Museum just in time for Holocaust Remembrance Day on May 6th. They have also worked hard to complete their study of the Cold War, Korean War, the Civil Rights Movement, as well as the Kennedy Era. We will end the year with our study of the Vietnam War. The students have worked hard this year in social studies, completing various projects and writing assignments throughout the year and have earned their summer vacation! Arabic: We are in the move with our alphabet letters our little sweet hearts. Through discovering our beautiful world of words we played, tasted and made several projects through this month. Lots of fun was in eating carrots and making our own clouds. Riding our own plane and flying through our school.The older kids sailed through the colors of the rainbow. The third graders were superb while performing the Arabic skitch about the strange planet, in a dream of Aleesha that changed her all class mates into aliens. Islamic Studies: We are still sailing into the history of our Umma , by studying about the Khulafa al-Rashdeen. Mean while the 2nd and 3rd graders are preparing their projects about main Mosques around the World.Beside that we are concentrating in building the Muslim characters and how we should respect each and every person around us and cherish the bounties and blessing that Allah (SWT) had provided us. Quran: Looking forward to have our annual Quran Competition , which will be held on April 20. May Allah (SWT) accept all your good deeds. Arabic classes 3-6: In the month of April we took Four Arabic Alphabets and did different projects associated with Arabic letters. For the lettter Jeem we made a carrot and ate some also. For the letter (haq) we made a small book that had things which starts with this letter. For the letter that we ate some corn in class. Yum! For the letter (Daad) we made a frog. 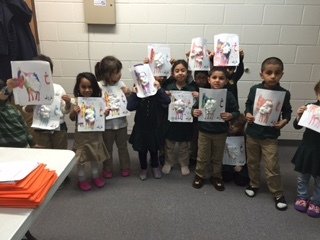 ​The 3-6 year old Spanish classes learned the song "El Burrito Enfermo" (The Sick Little Donkey), and in turn happily shared about their own aches and pains using "me duele." They are also learning several verbs and telling which activities they like to do. The 1st graders received some fun new Spanish books this month! We read one called "En el Árbol" (In the Tree). In our follow-up activity, students wrote sentences in Spanish and drew pictures about the activities they do at home, school, and other places. The 2nd graders used the verbs "voy" (I'm going) and "vamos" (we're going) to write sentences about where they plan to go and with whom. They are also working on numbers up to 100. The 3rd graders are observing how Spanish verbs work by changing their endings, as the second half of our novel ("Las Aventuras de Isabela") increases the diversity of verb forms. We brought "Isabela's" experiences into the classroom as we sampled fruit with chili powder as well as tostadas. ¿Cuál es tu deporte favorito? Students learned about sports and sport equipment by playing charades and acting out each of the different sports. The kids had a great time learnig the new vocabulary and interacting. Also we worked on various common expressions that include verbs. These verbal phrases will facilitate students understanding of the language and will also assist them in communicating their feelings and thoughts clearly in Spanish. Gym-Toward the beginning of the year Mrs. Arain discussed the 5 components of physical fitness with the students. Fitness isn't defined by appearance but by Muscular strength, muscular endurance, cardiovascular endurance, flexibility and body fat composition. Focusing on the first four, the 4th-8th grade students completed a competitive unit of dodgeball! Mrs. Arain even got in on the action. The classes have begun to slow things down and focus on flexibility with Yoga March Madness. The students are focusing on themselves and their inner peace. Gym- Mrs. Arain and her 4th-8th grade students have been enjoying the nice weather with competitive games of kickball. Theatre- The 4th-8th grade theater students have been hard at work memorizing their lines for their year-end skits. They will be performing in the school for their school mates on May 17-19th. We would love for parents to attend if possible. The performance schedule will be sent out shortly.